Floriana (Maltese: Il-Furjana or Il-Floriana), also known by its title Borgo Vilhena, is a fortified town in the South Eastern Region area of Malta, just outside the capital city Valletta. It has a population of 2,205 as of March 2014. Floriana is the birthplace of many famous Maltese, amongst which the composer of the national anthem, 'L-Innu Malti', Robert Samut; former Bishop of Malta Dun Mauro Caruana, the poet Oliver Friggieri, the writer and politician Herbert Ganado and Swedish Idol winner Kevin Borg. Floriana is named after Pietro Paolo Floriani, an Italian military engineer who designed the Floriana Lines, the line of fortifications surrounding the town. In Maltese, the town is called Il-Floriana by the local council. However, it is popularly known as Il-Furjana, and the latter is regarded as the official name by the National Council for the Maltese Language. Government sources use both variants. The town's original official name was Borgo Vilhena (or Subborgo Vilhena) after Grand Master António Manoel de Vilhena, but the name fell out of use in favour of Floriana or Furjana. The name Borgo Vilhena is now used as a title, just like Valletta has the title Città Umilissima. 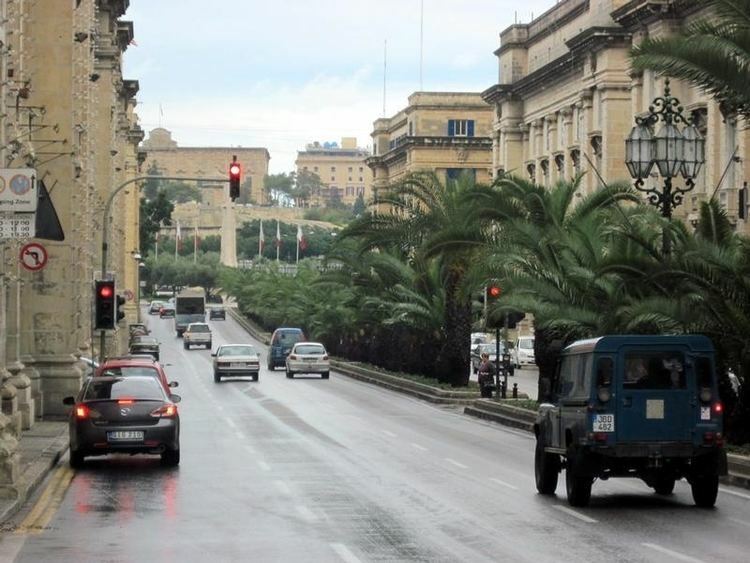 The origins of Floriana go back to 1636, when construction of the Floriana Lines commenced. The line of fortifications was built outside the fortifications of Valletta as an outer defensive line for the capital city. The lines were named after Pietro Paolo Floriani, the Italian military engineer who had designed them. The fortifications were partially defensible by 1640, but construction and modifications continued throughout the 17th and 18th century, being fully completed in the 1720s. The area between the Floriana Lines and the Valletta Land Front began to be built up in 1724, when Grand Master António Manoel de Vilhena founded the suburb Borgo Vilhena. The Vikings Sailing Club is also located in Floriana, though it is not associated with the Sports Association. Saint Publius is one of the patron saints of Malta and also the patron saint of Floriana. The Archipresbyteral Church of Floriana is dedicated to Saint Publius, traditionally acclaimed as the first Bishop of Malta. According to tradition, Publius received the Apostle Paul during his shipwreck on the island as recounted in the Acts of the Apostles 28:1–10. Being Maltese makes St. Publius the first Maltese saint and this explains the devotion which St. Publius enjoys around Malta and Gozo. One finds various chapels and statues scattered around the Maltese Islands which date back to hundreds of years. Msida Bastion Historic Garden, near Hay Wharf, another landmark which has been restored and reportedly contains the grave of Mikiel Anton Vassalli, an 18th-century writer and reformer who is much associated with Malta's national identity. Hydrofoil terminal, which is very busy during summertime with daily departures to Sicily. Floriana is a leading administrative centre, hosting the Ministry and Dept of Education, the Ministry for Resources and Rural Affairs, Police Headquarters and the Public Works Dept, The Licensing and Testing Office, and Land Transport Directorate of Transport Malta, as well as other financial and commercial companies spread around the former Colonial Administrative Area of Belt-is-Sebħ. The National Audit Office along with the Department of Contracts and the Malta Environment and Planning Authority, are located in two ravelins, Notre Dame and St. Francis, respectively. Floriana is home to the Hotel Phoenicia, one of the oldest and most prestigious hotels on Malta, as well as the 5 star luxury Hotel; and the Grand Hotel Excelsior. The annual Isle of MTV music festival has been held in Floriana since 2007. Vilhena Band Club (Soċjetà Filarmonika Vilhena) was founded in 1874. The first musical director of the band was Mro. Giuseppe Borg, and the first president of the Society was Baldassare Portanier. Kevin Borg a Maltese singer and Swedish Idol 2008 winner was born in the town. He moved to Arvidsjaur, Sweden in late 2007 to live with his girlfriend and was soon cast as a contestant on the Swedish Idol series. Balzunetta Named after Barcelonnette in Spain, hence translated to " Balzunetta"